Boats are popular on the Gold Coast for water recreation activities such as fishing and cruising. Just as with a car, boats can also suffer sun and water damage. Accidental knocks with pontoons, rocks or even with another boat can crack or damage the fibreglass shell of your boat. 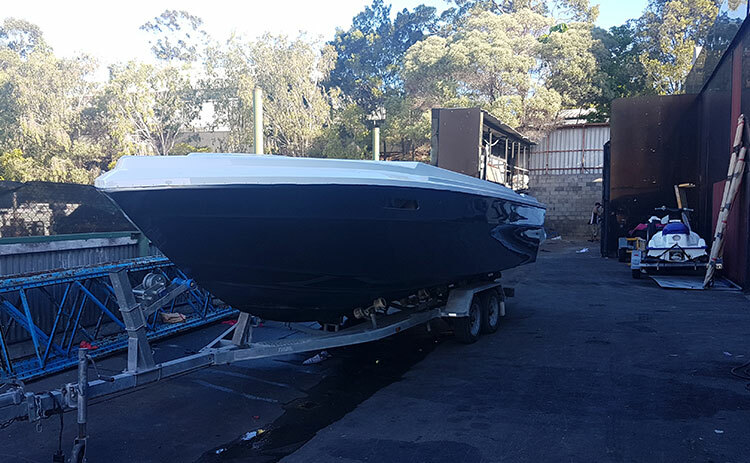 At Low.Co Customs, we can take care of any small to mid-size fibreglass boat and jet skis that requires a respray, touch up for scratches, or fibreglass repair work. A respray can be a great way to transform your boat and give it a fresh new look if you plan to sell it. We can spray the same colour or change the colour for a new look. No matter how well you look after your boat, oxidisation will eventually cause the paintwork to fade and/or deteriorate. If your boat is made of fibreglass and has any type of damage, we can repair it for you. We can also cover any aluminium repairs for your tinnies and fishing boats. Need boat painting or fibreglass / aluminium repairs? We can help. You can call us for a no obligation free quote on a respray for your boat, touch up painting, and fibreglass repairs. Our business hours are Monday to Friday from 6:30am until 6:00pm.